Gomelshchina (the region of Gomel) has the full right to be proud of the specialists who have graduated from the faculty of physical culture. These are statesmen, eminent scholars, honored workers in the sphere of physical culture and sport, trainers, professors, teachers and instructors-methodologists. The story began 62 years ago. 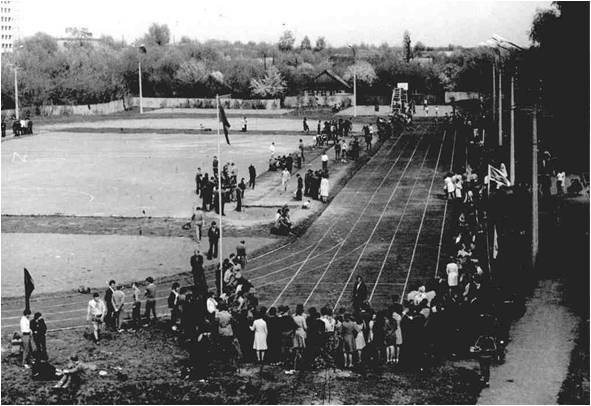 In 1949 the government of the BSSR decided to initiate the faculty of physical culture on the basis of the Gomel Pedagogical Institute named after V. P. Chkalov (in addition to the faculties of biology, philology, mathematics and physics). In 1953 there were the first 13 graduates. Since then the sports life of the faculty and the university got the new impulse. Along with the educational and training process there were a lot of mass activities: sports and athletic meetings, contests, morning exercises, camping trips and so on. Since 1960s the faculty began the new course of its development. It is notable that the first Belarusian champion of the Olympic Games L. G. Gayshtor graduated from the faculty these years. 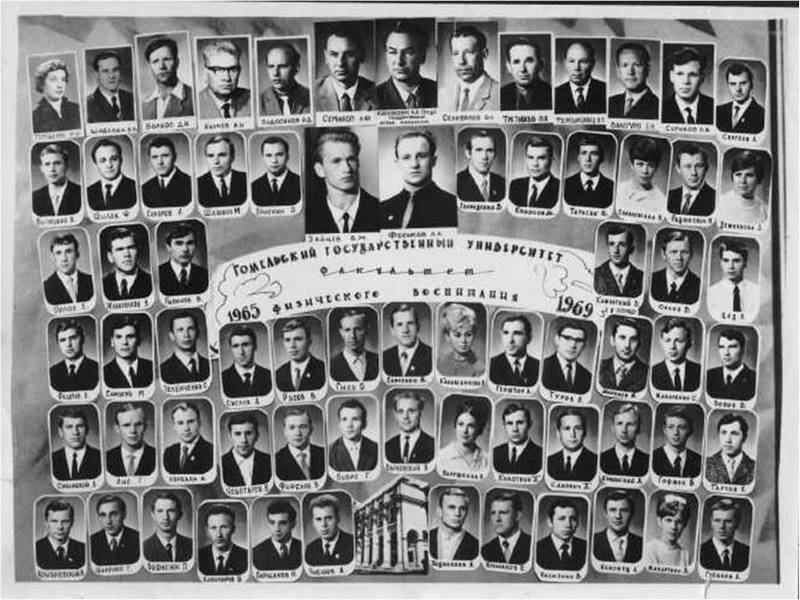 In 1969 the Pedagogical Institute was reorganized into the Gomel State University. After that the admission of the students increased and there were the cases when almost 200 students were admitted to the faculty. New academic departments and a correspondence faculty were organized. In 1970s-1980s a lot of students managed to achieve success in big-time sport. Here the competitors of the Olympic Games, the winners and prize-winners of the world, European and republican championships appeared. First of all they are the Olympic champion Elena Rudkovskaya, the Olympic prize-winners Evgenij Gavrilenko, Nikolai Kirov, Sergei Smal, Vugar Orudgev, Natalya Sazanovich, Anastasiya Melnikova, Natalya Stasyuk, Iryna Yatchenko and many other talented sportsmen. GSU stadium of F. Skorina. Track and field athletics competitions. Since 1990s the scientific school of physical culture and sport has been successfully functioning at the faculty. It determines the strategy of the courses for the regional sport science. In health-improving physical culture the strategy is the development and introduction of new healthy technologies, in the big-time sports – the management of training and competitive activity for high-skilled sportsmen. In 1993 in GSU the postgraduate study in the specialty 13.00.04 «The theory and a technique of physical training, sports training, improving and adaptive physical culture» which successfully works to the present was open. There was the whole group of young scientists. In recent years 15 dissertations, including 3 doctor’s are defended: candidates of pedagogical sciences, associate professors K. K. Bondarenko, M. V. Konyakhin, M. G. Koshman, V. S. Lemeshkov, I. L. Sivodedov, S. V. Sevdalev, O. A. Kovalyova, S. S. Kvetinsky, G. V. Novick, I.M.Maslo, S. M. Blotsky, A. E. Bondarenko, S. V. Sherenda, B. A. Tsarikov; doctors of science, professors of VA steel. Barkov, V.A. Medvedev, V.A. Koleda and G. I. Narskin. Since 1995 on the basis of faculty of physical culture of GSU the international scientific and practical conference «Problems of Physical Culture of the Population Living in Conditions of Adverse Factors of Environment» is regularly held. One of main goals of conference is discussion of opportunities of use of means, methods and forms of physical culture and sport in ecologically adverse living environment. Traditionally more than hundred leading experts in area of improving physical culture from Russia, Ukraine, Poland and the Baltic States take part in work of conference. The scientific researches which are carried out in recent years at faculty joined in the academic, republican and regional plans and programs of research works. Results of these researches gained recognition among leading experts in area of pedagogical sciences. On scope of researches more than 10 monographs are published (2 from them abroad), a number of methodical grants with a signature stamp of the Ministry of Education, are available numerous scientific publications. In 2000 at faculty the chair of sports disciplines opens. From the moment of its emergence training of the athletes specializing in game sports became more active. Our students who in structures of hockey club «Gomel», football club «Gomel», the Gomel volleyball club became champions and owners of a cup of Republic of Belarus set the tone in teams.